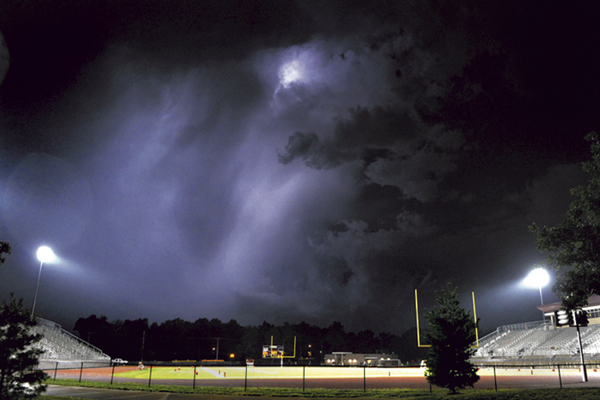 Lightning and severe storms wreaked havoc with the Friday night football schedule. Games on both sides of the state line were delayed with many being forced to complete Saturday. Below is a list of the games that will finish this weekend. All games are Saturday unless otherwise noted. Basehor-Linwood at Turner, 2 p.m.
Louisburg at St. James, 10 a.m.
Spring Hill at Eudora, 7 p.m.
McLlouth at Pleasant Ridge, 3:30 p.m.
Jefferson County North at Leavenworth- Immaculatta, 2 p.m.
Bonner Springs at Mill Valley, 1 p.m.
Olathe South at Olathe East 1 p.m.
William Chrisman at Belton, 11 a.m. Mid Buchanan at Plattsburg, 5 p.m.
Blue Springs at Lee’s Summit North, 5 p.m.
Liberty North at Winnetonka, 11 a.m.
Ruskin at Truman, 2 p.m.
PrepsKC’s live scoreboard will resume with all of track all of these games once they resume.